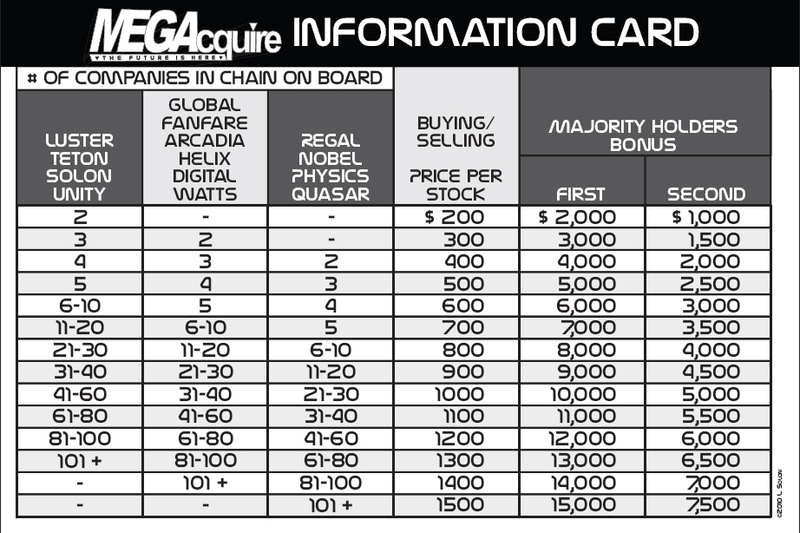 MEGAcquire includes six (6) Information Cards. The information card breaks the companies into groups of pricing ranges that consist of low, medium, and high-priced stocks. There are two low-priced hotels, Luster and Teton, and two low-priced corporations, Unity and Solon, which start at $200. There are three medium-priced hotels, Global, Arcadia, and Fanfare, and three medium-priced corporations, Helix, Digital, and Watts, that start at $300. There are two high-priced hotels, Regal and Nobel, and two high-priced corporations, Physics and Quasar that start at $400. The information card works by finding the column on the left that contains the company in question and going down the column to find the number of tiles that are in that company. Once that number is found, look to the "price per stock" column which will display the amount that the stock certificate is worth. The process is the same when cashing out a company. Just go to the "Majority (First)" and "Minority (Second)" columns to find the payouts for the majority and minority stockholders.